Browse: Home / Articles / Does the Constitution Need to be INTERPRETED? Ever since the US Constitution was ratified the question asked over and over is: who has the prerogative and responsibility to interpret the Constitution? Early on, the Supreme Court assumed the right to exercise this function but nowhere in the words of the Constitution (the document itself) is this practice authorized. Before jumping to the conclusion that the Constitution requires interpreting and accepting anyone’s interpretation, I would ask what I consider a much more pertinent question and its corollary: Does the Constitution need to be interpreted, and if so why? I can think of only three possible reasons why our Constitution would need interpreting which I will list and examine in the increasing level of likelihood and incidence of interpretation. The way a clause is worded doesn’t make sense. The way a clause is worded is ambiguous or imprecise. Part of the Constitution doesn’t say what we want it to say. As I will demonstrate, interpret generally is used as a euphemism for disregard or make the Constitution say what its actual words don&apos;t.
Case 1 – The way a clause is worded doesn’t make sense. I can’t think of an example of such gross incompetence in the original Constitution, but the Twelfth Amendment states that a presidential Elector can’t vote for a presidential and vice-presidential candidate both from his own state. If you assume that the Electors were designed to cast a final vote, (which I don’t), that means that if the Electors are given a list of candidates and one presidential and one vice-presidential candidate are from Delaware, all of the Electors except those from Delaware could vote for both. What sense does that make? Someone needs to interpret some sense into that one. Case 2 – The way a clause is worded is ambiguous or imprecise. The migration, or importation of such persons as any of the states now existing shall think proper to admit, shall not be prohibited by the Congress prior to the year one thousand eight hundred and eight, but a tax or duty may be imposed on such importation, not exceeding ten dollars for each person. Even though they couldn’t bring themselves to write the words slave or slavery in the Constitution, by dancing around the issue with euphemisms, a conversion time was allotted. The only part of the system that ended up being addressed was the foreign slave trade which to the credit of congress was abolished in January of 1808. It took a horrible war which devastated the nation and claimed the lives of 620,000 Americans to finally resolve the issue. Case 3 – Part of the Constitution doesn’t say what we want it to say. Now we come to the part of the issue that seems both most pervasive and most perversive. This is the problem with most interpretations and interpreters. Rather than studying the Constitution and trying to figure out what it is saying, we usually try to find a way to make it say what we want it to say. By our “cut and paste” methodology—taking a piece here, ignoring a piece there, and interpreting a piece somewhere else, we arrive at a system of government that is a modified democracy rather than the modified federation that the original Constitution defined. To illustrate this point, we can look at the First Amendment and the way that it has been interpreted. This amendment contains a list of things that congress may not do. Rather than follow the Constitution, our government has declared a wall of separation between church and state and made themselves the arbiter of that separation. Freedom of speech is now interpreted to include disruption of the daily activities of others and even destruction of property, and not only are we free to petition government but the First Amendment supposedly allows rowdy gathering and protesting of any entity or organization that seems to be doing or not doing things the particular mob assembled wants them to do or quit doing. How does that become peaceably assembling? What freedom of speech and freedom of religion do not include are things like prayer in schools and expressions like “Merry Christmas” or “God Bless You”. If Congress can make no law concerning these things, where did all this nonsense come from? Probably the most common interpretation given to the Constitution by educated people who should know better, is the notion that it defines a two-party (or any party) system of government. Unfortunately the “two-party system” is the system that supplanted “Constitutional Federalism” when America turned its collective back on the original Constitution. It happened so early in our history that Americans almost without exception assume that party politics is constitutional. 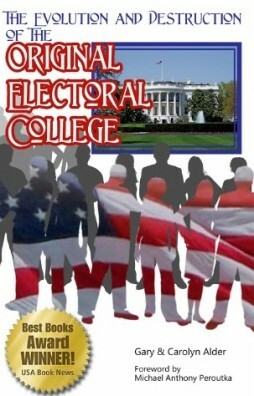 It led to replacing the recommendations of the best presidential candidates by independent Electors to the confirmation of the least-worst options as determined by a party-controlled popular vote between self-nominated and self-interested demagogues who bribe the people with legislative promises which they have no constitutional authority to fulfill if they do get elected. Most of the time the popular vote for President coincides with the party manipulated electoral votes, but the election of 2016 was an exception. Now there are many who are trying to manipulate the vote of the Electors in different directions. It will be interesting to see how this works out. There is some hope that this confusion will lead to a study of the actual words of the Constitution and the concepts that those words convey. Time will tell. which invites this rhetorical question: when the officers take the oath to support this Constitution, are they bound by the words of the Constitution or by some interpretation; and if so which one? Having analyzed the reasons why the Constitution could need some interpretation, I conclude that what is needed most is careful study of the actual words of the Constitution by both the elected officials and all Americans. This study must include a look at the whole picture not just a few select pieces. If the incumbents do not follow the Constitution, they must be replaced. If after careful study, changes seem appropriate, let them be made by amendment not by interpretation.